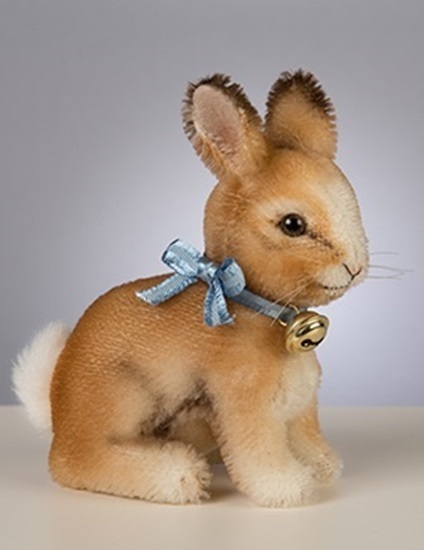 Meet Plunk... a sweet little bunny just in time for Spring ! Plunk is designed in a sitting position and measures 5 inches tall, (5.5 inches including ears.) He is made of the finest Schulte mohair from Germany with artistic airbrushed coloration. Jointed at the neck for playful posing, Plunk has glass pupil eyes, hand-embroidered features and inset horsehair whiskers. A brass bell on a blue pure silk ribbon is daintily tied around his neck. Not a single detail has been overlooked in bringing this happy little hare to life! Plunk is a worldwide limited edition of 250 numbered pieces. Included will be the signed, numbered certificate of authenticity.